The most famous Indian beaches are those of Goa, Mumbai and Chennai. 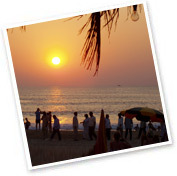 Get to know more on beaches of India. An extension of Calangute beach, Baga beach is one of the most fascinating and secluded beaches in Goa. It is just the perfect place to relax and laze around for those who want to stay away from the hutle, bustle and crowded city life. India is bounded by water on three sides, providing it with a 6,000 km long coastline. This resulted in the country being blessed with a large number of beaches, which boast of scenic locales, pristine beauty and peaceful calm. The perfect combination of the sun, the sand and the sea is present at a number of places in the country. Indian beaches serve as the perfect getaway destinations for the people, who want to escape from the stressful and hectic city life for sometime and spend some quiet moments with their family and friends. In India, beaches can be found in the coastal states of South India, along Gujarat, Maharashtra, Orissa, Goa, West Bengal, Daman & Diu and the islands of Lakshadweep and Andaman & Nicobar. Amongst them, the most famous ones are those of Goa, Chennai and Mumbai. Apart from their beauty, these beaches are known for the various stalls that dot their landscape and offer different knick-knacks and other such items at very reasonable prices. A large number of people come to India on beach tours every year, to relax, to rejuvenate and to have fun. Tourists, both from India as well as abroad, also visit the beach destinations of this country because of the numerous adventure sports options they offer, like parasailing, angling, water biking, jet skiing, scuba diving, snorkeling, etc. They give you a rush of adrenalin and add the thrill factor to your holiday. The beaches of India are well maintained and apart from the natural beauty, you can also taste the local delicacies of that particular state, which are available aplenty at the shores. Sounds tempting enough? 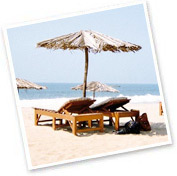 Then come for a beach tour of India and go back fully rejuvenated with pleasant memories.